Once again, on Saturday, US Secretary of State John Kerry tried to extort Israeli concessions to the PLO by threatening us with a Western economic boycott. Kerry is obsessed with Israel’s economic success. Last May he told us that we’re too rich to surrender our land. Now he’s saying we’ll be poor if we don’t do so. The anti-Semitic undertones of Kerry’s constant chatter about Jews having too much money are obvious. But beyond their inherent bigotry, Kerry’s statements serve to legitimize the radical Left’s economic war against the Jewish state. Administration supporters and fundraisers from Code Pink and other pressure groups, as well as the EU understand that if they escalate their economic and political persecution of the Jewish state, their actions will be met with quiet understanding, and even support from the Obama administration. This is so even if the State Department issues indignant press releases expressing fury that Israeli elected officials have the chutzpah to object to Kerry’s behavior. Israel has been subjected to plenty of abuse from American secretaries of state. But Kerry’s incessant talk of “illusory” Jewish money is unprecedented. Why does Kerry believe he can get away with this? The overwhelming majority of US lawmakers oppose economic warfare against Israel. The vast majority of Americans support Israel and believe that a Palestinian state will support terrorism and be hostile to Israel. So if the American public opposes Kerry’s obsessive aggressiveness toward Israel, who is supporting him? Who is giving him cover for his anti-Jewish smears and his irrational focus on Jewish communities beyond the 1949 armistice lines? The answer is as infuriating as it is apparent. It is the Israeli Left and through it, much of the American Jewish community that enables Kerry’s diplomatic aggression against the Jewish state. Operating under their cover, Kerry feels free to engage in anti-Jewish bigotry directed against Israeli society. He believes he is immune from allegations of ill-will toward Israel even as he places the full weight of the US government behind a plan that will endanger Israel, bring no peace, destabilize the Middle East and fail to win the US any friends or allies in the Islamic world. On the face of it, it is hard to understand why leftist Israeli Jews cheer Kerry’s aggressive attacks and threats. After all, they live here. They know as well as the rest of the country that if Israel bows to his will and surrenders Jerusalem, Judea and Samaria to the PLO the move will bring no peace. Rather it will unleash a Palestinian terrorist assault the likes of which we haven’t seen before. They know that the international delegitimization of Israel only expands with every Israeli concession to the PLO, and that giving up the store will bring us no respite from the Western world’s assault on our right to exist. So what do they gain by giving cover to Kerry? Why do people like Labor MK Shelly Yacimovich applaud Kerry for placing unrelenting pressure on the government to take steps that the majority of Israelis oppose and urge him to keep it up? Ron Pundak, one of the original architects of Israel’s embrace of the PLO and the so-called two-state solution at Oslo in 1993 supplied the answer in a recently published paper. Rather than develop talking points to convince Israeli Zionists that they are wrong to view the two-state model as an anti-Zionist project, Pundak admitted they are right. Indeed, destroying the Zionist underpinning of the Jewish state is not a byproduct of the two-state model. It is the purpose of the two-state model. Pundak’s explanation is not new. Before the Sharon government surrendered Gaza to Palestinian terrorists and forcibly expelled its 8,000 Jewish residents from their homes, Haaretz published an unsigned editorial along the same lines. The editorial concluded that all the talk about enhanced security or peace was pure nonsense. The purpose of destroying the communities in Gaza was to destroy the political and social power of religious Zionism in Israel. Other leftist commentators and policy makers including Doron Rosenblum, Avirama Golan, Avrum Burg, Efraim Sneh, Dan Margalit and Ami Ayalon made similar arguments. 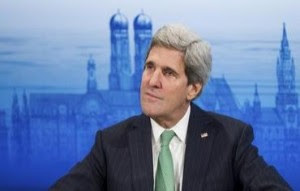 For Pundak and his colleagues in the post-Zionist camp, Kerry is a key ally. And to the extent Kerry weakens the government and its supporters, he is a strategic asset. True, Kerry’s “framework” will bring no peace. But if what Pundak and his camp were after was peace, they wouldn’t have embraced the PLO to begin with. They would have cultivated pro-Israel Arabs who would lead their people into Israeli society. That is, they would have done precisely what center- right governing coalitions – that included religious Zionists – sought to achieve, with significant success, in the decade and a half that preceded the phony peace-process. Israel is a democracy. And it is perfectly legitimate for Pundak and his colleagues to try to advance their policy goal of replacing Zionism with a de-Judaized state or anything else they wish. What is illegitimate is the means they have employed to advance their goal. In a democracy, the strategic goals and policies of the government are supposed to be based on the will of the public as expressed at the ballot box. In Israel, there is a political party that shares the goals of the post-Zionist camp. It is called Meretz and it receives between two and five seats in the Knesset every election. Pundak and his colleagues know that they cannot convince the majority of Israelis to abandon Zionism in favor of their anti-Jewish vision of the future. So rather than tell us the truth about what they are doing, they engage in subversion and subterfuge. They call themselves “the peace camp,” and use outside pressure and coercion to bend an unwilling public to their will. For them, Kerry is best when he’s worst for their country. And Kerry knows this. And so he piles on the threats, and the anti-Semitism, and with their support, he knows he can get away with it.